integrating the advance duplex winding compensation mode、noncontact switch and microcomputer controlled regulating technology,SWY and DWY single/three phasa senies microcomputer noncontact compensated、fast adjustment、three phase automatic balanced,no mechanical malfunction or carbon wearting,also with the functions of delay、under/over voltage alarm and prohnology. 1.Adopting the advanced duplex winding compensation technology which ensure little waveform distorm distortion. 2.Adopting one-chip computer to control the thyristor and shifting combination for tining compensation adjustment enable it to realize the fast non-contact adjustment.Strong instantaneous overload capacity makes it available with various loads. 3.Adopting one-chip computer split-phase control,it has the functions of delay starting-up,three-phase automatic balance adjustment,display、alarm and protection of open-phase、overrun and malfunction etc. Auto Electrification，Time delay output，Output Back to Middlr，Overvoltage、Under-voltage、Over-current、Phase Sequence、Phase Breaking、Protection,Soung & Flash Alarm,Voltage Regulation and Switchover with Civil Electricity. 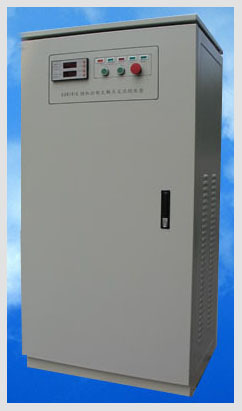 1.The non-contact voltage regulator does not have mechanical runnong;utilizes the large-scale integrated circuit;adopts crystal brake tube(controllable silicon) and zero-voltage breaking(specialized technology) to obtain the purpose of voltage regulation.The product is free of maintenance. 2.The product has the protection function to all circuits,as well as protection functions of anti-lightning stroke,anti-surging and anti-harmonic.The control of the primary circuit uses imported components. 3.It is also possible to design according to the special requirements of the customers.